A Colt Named Sue–My first racecall – Welcome to the 2019 Beemie Awards! “Hey kid, you’re calling the next race.” hard to believe it’s been 8 years since Mike O’Brien said that to me in the equibase room at Portland Meadows. It was January 8, 2006 and I was 25 years old and had been spending most of the fall and winter on the roof at Portland Meadows. I would drive down each weekend and hang out in the equibase room (chart callers) because I was friends with Steve Peery and Gary Norton, who were the chartcallers. Mike O’Brien had a separate door that connected to equibase that made up the announcer’s booth. It was a tiny room (pictured below), maybe 4 or 5 feet deep and probably 12 to 15 feet long. Between races I’d hang out in the equibase office and then about 5 minutes to post time I’d walk out on the roof and memorize the horses and call the race into my tape recorder. Then I’d go back in and often Mike O’Brien who was the racecaller at the time would listen and offer suggestions, comments, and lots of encouragement. So after months of practicing I was down there on January 8th practicing. The 5th race finished up and when I got back to the room to listen to my practice call, Mike O’Brien came out and said “Hey kid, you’re calling the next race.” I smiled and asked if he was serious and my first reaction was to get nervous. I think at this point I didn’t think I was ever going to actually call a race, it was just a fun something to do during the wintertime and it kept me away from the betting windows. So I looked at my program that I had colored the night before and saw seven horses would be competing in the next race. So I walked into the announcer’s booth with Mike and he showed me how to work the mic and where to stand and next thing I knew the horses were coming onto the track. I did the post parade, trying to do it in my best announcer voice. I wasn’t too nervous and it went alright! So I looked through my binoculars and repeated the name of each horse to help me memorize it. “The horses have reached the starting gate.” So at Portland Meadows the window in front opens and I opened it up per Mike’s recommendation. Hearing my voice going out over the speakers, with those tens and tens of people down below hearing me, I immediately got super nervous. The last horse went in. “And the race is on” I have this video and the amount of fear in my voice is comical at that point. I pinned my hands up against the windowsill because they were shaking so madly. I started calling the race and it was honestly going pretty well. They got to the far turn and my voice started weakening. Turns out with all my nerves, I had forgotten to breathe. Ooops! I kept pushing on with hardly any air in my lungs. Finally as they got to the quarter pole I had to stop and take a huge breath. They straightened away and here came “A Colt Named Sue” flying down the center of the track. I picked him up and I’m so not going to lie, I was rooting for him. Firstly, because he was my good buddy Ben’s horse and Ben had won the previous two races on the card. Secondly, because I had a call ready for A Colt Named Sue. I took the famous line from the Johnny Cash song “A boy named sue” and just used it at the wire. “My name is Sue how do you do!” I clicked off the microphone and remember having pretty mixed emotions. I had done it and gotten through it. But it wasn’t necessarily very good either. Everyone there at Portland Meadows was really complimentary, but I still felt like I didn’t get to showcase what I could do. What I learned though is that doing it on the stage is way different than doing it behind the curtain. But I remember driving back to Seattle that evening and thinking, I really want to do that again. Luckily for me Mike let me call one or two races each week for a few weeks and then I filled in for a whole card when he was sick in February 2006. I used those calls to make a demo tape and got the job at River Downs. Mike actually resigned after that season due to his other regular job and I was hired. Hard to believe it’s been 8 years now since I called my first race. I’ve called probably 5 or 6 thousand races since then. It’s been an interesting job. 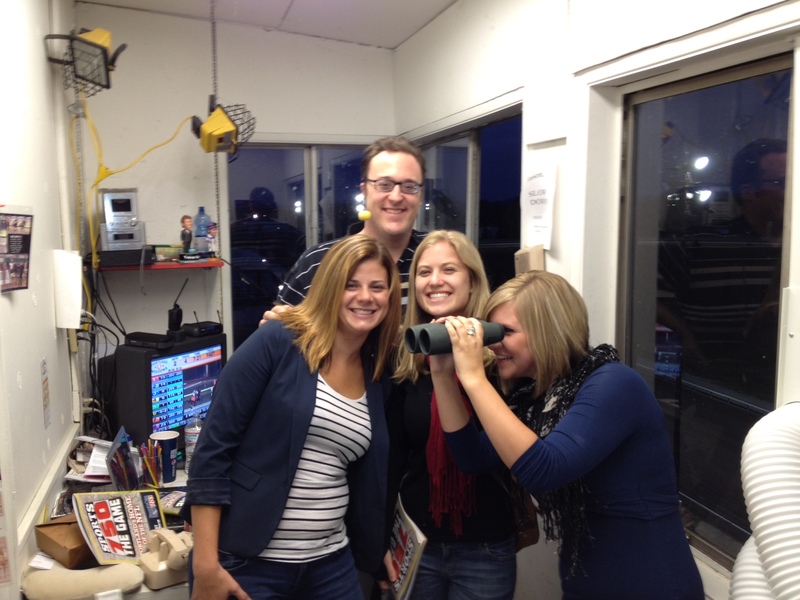 I’m not sure how much longer it will last, but I’ll certainly never forget that first race call. 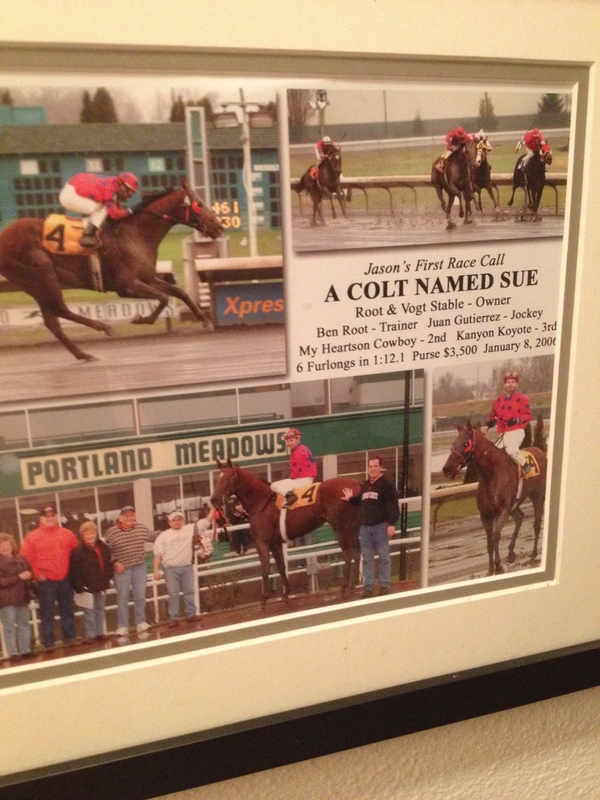 Here’s a picture of that race that hangs in my hallway.